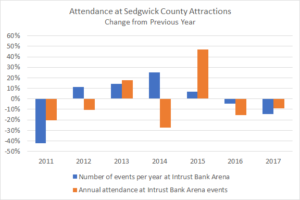 The true state of the finances of the Intrust Bank Arena in downtown Wichita are not often a subject of public discussion. Arena boosters cite a revenue-sharing arrangement between the county and the arena operator, referring to this as profit or loss. But this arrangement is not an accurate and complete accounting, and it hides the true economics of the arena. What’s missing is depreciation expense. 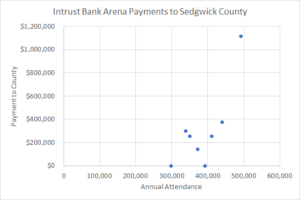 Intrust Bank Arena Payments to Sedgwick County. Click for larger. The Arena Fund represents the activity of the INTRUST Bank Arena. The facility is operated by a private company; the County incurs expenses only for certain capital improvements or major repairs and depreciation, and receives as revenue only a share of profits earned by the operator, if any, and naming rights fees. The Arena Fund had an operating loss of $4.3 million. The loss can be attributed to $4.5 million in depreciation expense. Financial statements in the same document show that $4,522,596 was charged for depreciation in 2017. Trends of events and attendance at Intrust Bank Arena. Click for larger. 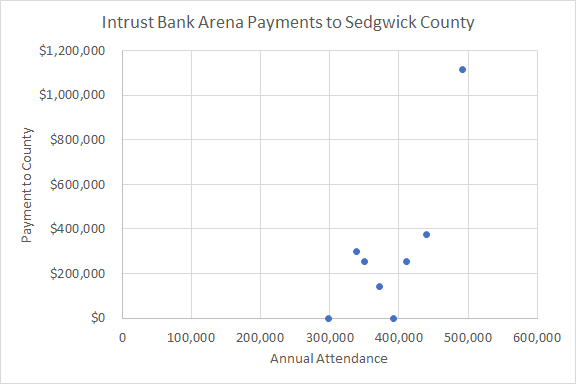 If we subtract SMG payment of $300,414 from depreciation expense, we learn that the Intrust Bank Arena lost $4,222,182 in 2016. Depreciation expense is not something that is paid out in cash. That is, Sedgwick County did not write a check for $4,522,596 to pay depreciation expense. Instead, depreciation accounting provides a way to recognize and account for the cost of long-lived assets over their lifespan. It provides a way to recognize opportunity costs, that is, what could be done with our resources if not spent on the arena. The contention — witting or not — is that the capital investment of $183,625,241 (not including an operating and maintenance reserve) in the arena is merely a historical artifact, something that happened in the past, something that has no bearing today. There is no opportunity cost, according to this view. This attitude, however, disrespects the sacrifices of the people of Sedgwick County and its visitors to raise those funds. Since Kansas is one of the few states that adds sales tax to food, low-income households paid extra sales tax on their groceries to pay for the arena — an arena where they may not be able to afford tickets. The upshot: We’re evaluating government and making decisions based on incomplete and false information, just to gratify the egos of self-serving politicians and bureaucrats. In February 2015 the Wichita Eagle reported: “The arena’s net income for 2014 came in at $122,853, all of which will go to SMG, the company that operates the facility under contract with the county, Assistant County Manager Ron Holt said Wednesday.” A reading of the minutes for the February 11 meeting of the Sedgwick County Commission finds Holt mentioning depreciation expense not a single time. Neither did the Eagle article. That followed her op-ed from a year before, when she wrote: “And, of course, Intrust Bank Arena has the uncommon advantage among public facilities of having already been paid for, via a 30-month, 1 percent sales tax approved by voters in 2004 that actually went away as scheduled.” That thinking, of course, ignores the economic reality of depreciation. 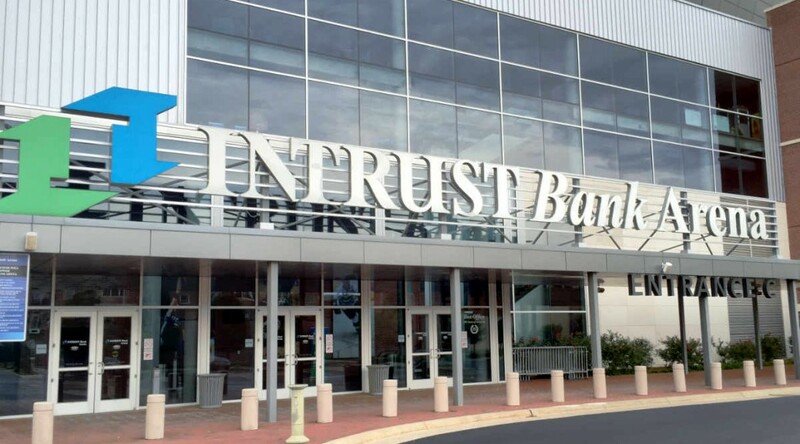 Even our city’s business press — which ought to know better — writes headlines like Intrust Bank Arena tops $1.1M in net income for 2015 without mentioning depreciation expense or explaining the non-conforming accounting methods used to derive this number. All of these examples are deficient in an important way: They contribute confusion to the search for truthful accounting of the arena’s finances. Recognizing depreciation expense is vital to understanding profit or loss, we’re not doing that. I regularly pointed out the depreciation aspect on arena finances while serving on the county commission. However, depressing depreciation numbers were seldom mentioned in arena financial news coverage. How sad for county taxpayers on all capital projects for local, state, and federal governments. A thoughtful and thorough article. Two kinds of accounting come to mind when I see of this. Generally accepted accounting principles (GAAP), and accounting of economic reality. Depreciation would be included in both of these, but I would posit it is the economic reality calculation that would matter -and be difficult or impossible to fully quantify. The cost (including depreciation) of the arena is known, but I suspect there are upsides that are not quantified either. For instance, if out of town visitors attend a show and spend money at a nearby restaurant, there is benefit to the business and the tax base. GAAP would not allow those things on an income statement, and I suspect most voters were betting on those hard to quantify benefits as opposed to a profitable standalone arena business. The arena’s success would best be measured as part of a local “system” rather than on a standalone basis. I’ve also seen the “regressive tax” argument before. My position is that the overall tax system is so heavily biased towards progressive that one or two things that are regressive barely makes a dent into flattening things out.